I'll tell you first what a Coram boy is. Then I'll tell you about the Coram man. It is the middle of the eighteenth century. Many babies, too many babies, are born into dreadful poverty. Their parents are too poor to feed and clothe them. Some babies are born to unmarried young women and they cannot be kept for fear of the public shame. What is to happen to all these babies? Well, they must go to the parish orphanages. But no-one in the parish orphanages will squander affection on these babies. Funds are only grudgingly given by the great and good of the parish. The babies die through neglect and disease. Possibly, a baby might survive if he is taken in by the Coram Hospital. There he will be nurtured and educated until he is old enough to make his own way in the world. 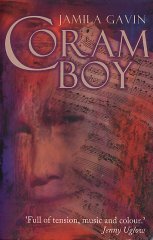 He is a Coram boy. There are Coram girls too. Captain Thomas Coram was a retired sea captain who founded the hospital as an act of charity. The Coram Foundation still exists today. In 1741 when Captain Coram founded his hospital there was a desperate need for such orphanages. How could you part with your new-born son or daughter? It would be impossible, I think, unless you felt that you were giving your baby a better start in life than he might otherwise have. So, a man travels round the countryside collecting babies. You have to pay him to take your baby. He promises faithfully to deliver your precious baby to the Coram Hospital. He is the Coram man. What does the Coram man do with the babies? It was a hurried affair in all that wind and rain and darkness and the swinging light from the storm lantern, which Otis hung on a branch directly over the ditch. Otis plunged in his spade. Nothing too deep or careful. There was a lot of water. Just dig a hole deep enough to submerge the bundles. Foxes would do the rest. He wouldn't have bothered burying them had he not taken money for them and given undertakings. Otis dug and Meshak went from mule to mule, extricating one bundle after another from the panniers to hand to his father, who dropped them like seeds into the ditch. The Coram man is clearly nothing to do with the Coram Hospital. He is making a living out of the misery of others. He is Otis Gardiner and he is evil. This is the setting for this tense and emotional story. Here you meet Alexander Ashbrook, young heir to a great estate. Will Alexander really sacrifice his inheritance and dedicate his life to music? You also meet Melissa, who makes the catastrophic mistake of conceiving and giving birth to Alexander's illegitimate son. Through the slightest chain of circumstances the baby arrives as a foundling at the Coram Hospital, wrapped in the finest French cotton gown. But it might have been different - he passed through Otis Gardiner's hands ... Will Melissa ever see her son again? Some of the scenes in this gruesome book are disturbing. It is undoubtedly a tragedy. There is teenage love but it is spoiled by the reality of life in the eighteenth century. You need to be a fairly mature reader to cope with the ideas discussed, but you may feel that the style of writing is aimed at rather younger readers. Don't let this put you off. It is a striking and memorable book. See for yourself. Highly recommended!